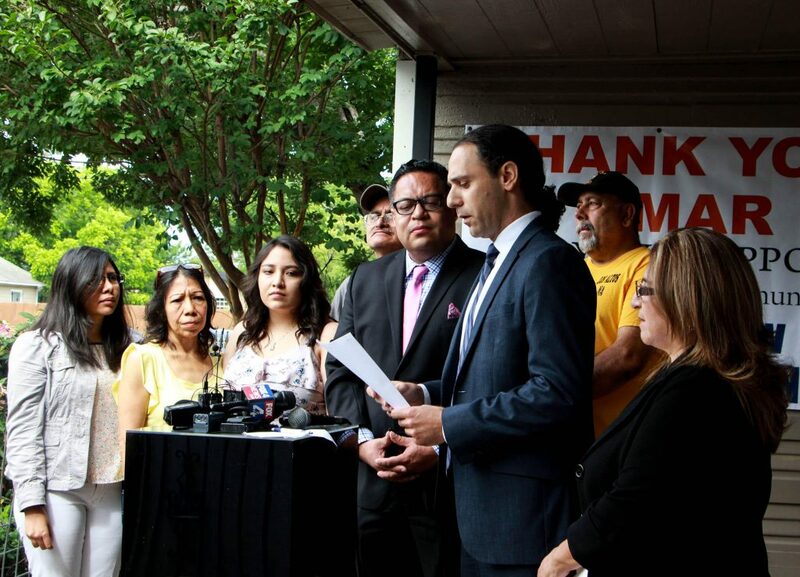 The owner of hundreds of aging West Dallas rental homes that had been slated for closure said Monday, May 22 that he will sell upwards of 75 of them to tenants. Hours later, a Dallas County district judge extended a move-out deadline for remaining renters until October. HMK Ltd., which owns the homes, plans to offer 75 occupied houses, and a few dozen vacant homes for sale– each for $65,000. HMK will finance 20-year mortgages. Monthly payments should be about $575. Many of the renters are low-income and pay as little as $300 a month in rent. “This is a great community, and with new homeowners, it will be even greater,” Khraish Khraish, HMK Ltd. co-owner, said at a news conference Monday morning. Khraish said it got “harder and harder to sleep at night” thinking that more than 100 families would be “put on the street.” He describes the offer as “a win for West Dallas” — and for the city, too. “I don’t see any losers here,” he said. 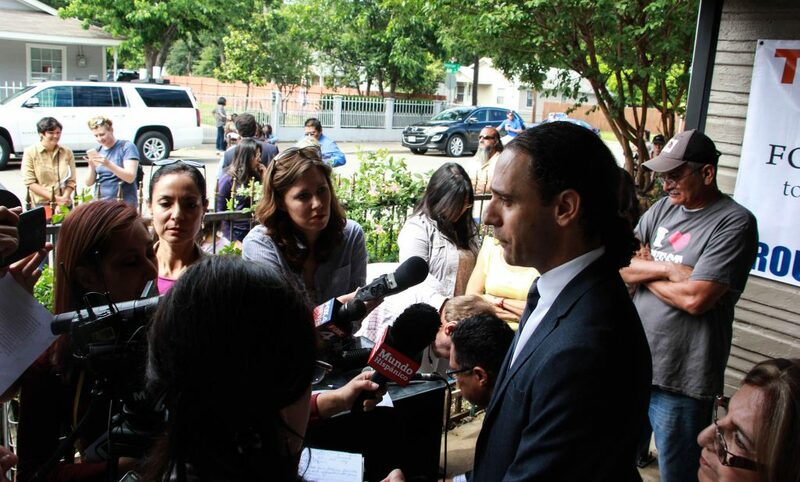 Alonzo faces a June 10 election runoff with Omar Narvaez, who was beside Khraish at Monday’s press conference. 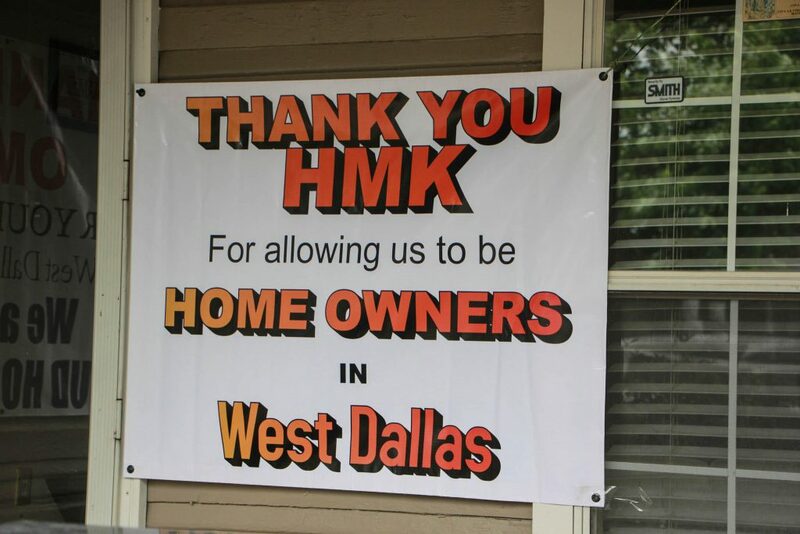 Also Monday, Dallas County District Judge Ken Molberg extended a temporary injunction that allows HMK residents to stay in their rental homes until October. Renters in 305 rental homes had faced a June 3 deadline to move out, and more than half of the tenants have already left the neighborhood. The rental homes were no longer up to code after the Dallas City Council passed new housing standards last fall. Khraish has said upgrading the rental houses would be too expensive. Demolishing the houses and starting from scratch would price those families out of the new homes. The city of Dallas had agreed not to fine the landlord for violations through the end of the school year. As of earlier this month, about 110 families renting HMK homes remained in the neighborhood. Because they pay just a few hundred dollars a month in rent, they don’t know where to go. Khraish Khraish, third from right, announced Monday morning he’s offering to sell several of his rental homes to tenants in West Dallas. West Dallas is a longtime black and Latino neighborhood that’s rapidly gentrifying. 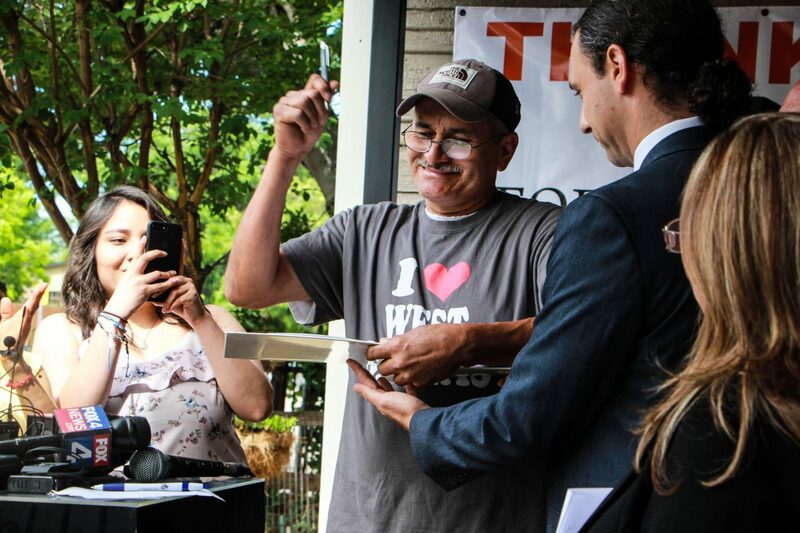 Several renters appeared at Monday’s news conference – one of them was Joe Garcia. He and his mom live in a rental house that HMK considers a “re-development zone.” Khraish hopes to move the Garcias and about 40 other families into houses that other residents have already left. Joe Garcia says he’d be happy to move a few streets over if that means he could own a home. For families paying $300 to $500 a month in rent, the thought of moving was terrifying. Noemi Piña couldn’t find anything she could afford. “Because you see we go to other places? And they would charge us $800, $1,000,” she said. So Monday, when HMK announced the news, Piña felt a surge of hope. “Finding this out? … It’s a relief. It’s a relief for us,” she said. Jessica Diaz- Hurtado is an NPR Kroc Fellow. As part of her fellowship, she’s spending several months reporting at KERA.